1 Our Traditional September Rendezvous weekend. 5 Plews for shoes – Trivia. 6 A few thoughts fired at Random. Saturday evening in the open-faced-shelter; Bob Ellis announces the hunt results. Peter Convey photo. Our Traditional September Rendezvous weekend. Rain, showers and more solid rain; that was the weather pattern leading up to September’s Rendezvous at Caveat. Yes, we’ve just come through our wettest few months for many a long year. About ten years in fact, this is why we hadn’t previously seen it so damp underfoot at Bernard’s Cache. Oh, the camp area was perfect as usual; it was just the farm paddock access tracks that caused a few minor concerns, especially for the 2WD owners. All that rain had caused us to cancel earlier working-bees planned. for the erection of a second toilet and a separate urinal. 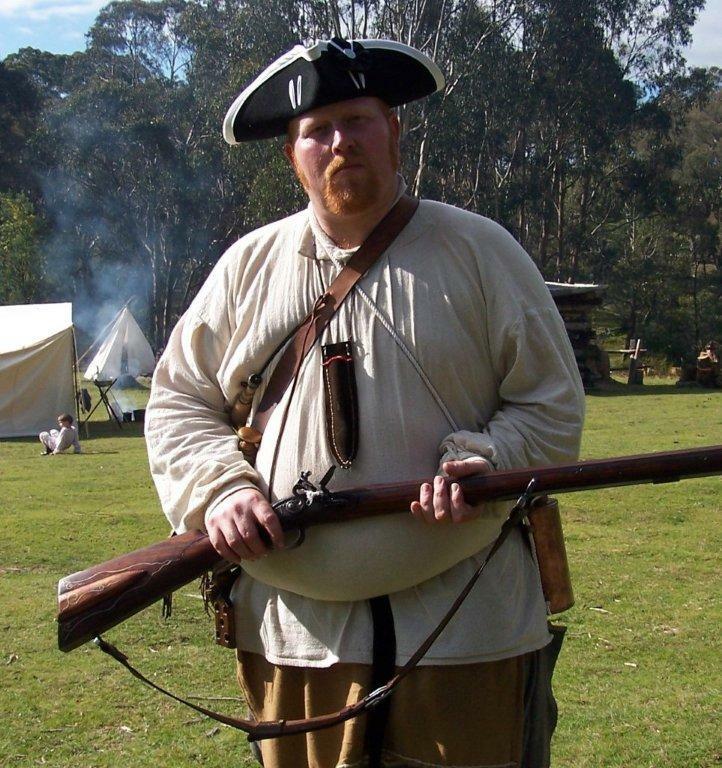 So Friday was the scene of feverish toil and bustle to complete these amenities before removing 4WD mules, digger, trailers and all mod tools; then donning the funny clothes to turn back the time zone to pre 1840 to fully immerse in re-enactment of the wonderful black powder era. Almost complete – separate His and Hers and a Boys only. Peter Convey photo. By mid-afternoon Friday we could estimate a record roll-up of Buckskinners and pilgrims from a diverse period leading up to that 1840 mark. In all we had 22 adults plus a couple of youngsters and a total of 15 camps under white canvas. We had expected, and should have had a few more roll up, but I guess the damp rot had set in after the recent rains and quite a few regular pilgrims were sadly missing. Don’t ya wanna have fun no more? Mind you, there was no shortage of fun, music and merriment all weekend long. 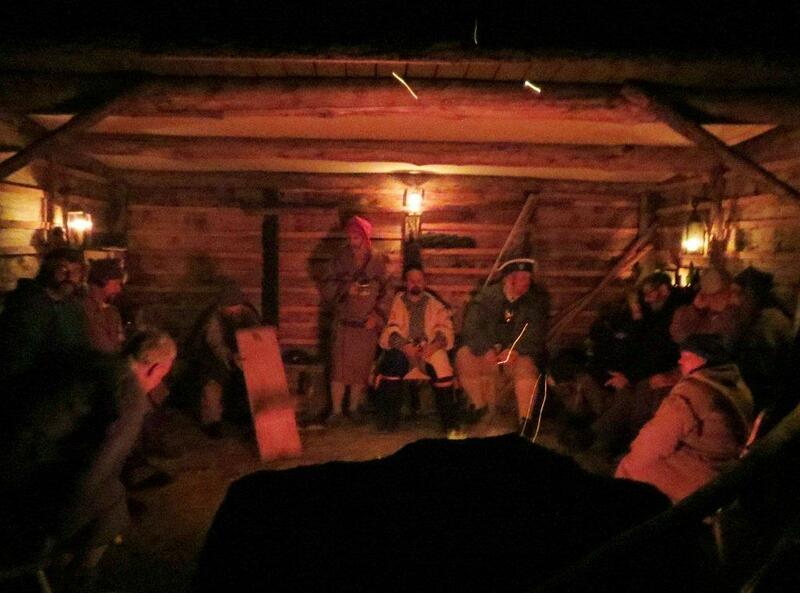 The walls of the open-faced-shelter bulged as folks drew together for warmth around the roaring fire each evening. Ian entertained with guitar and song nightly. Of course he was ably assisted by a chorus of “tuneful” voices on renditions of our favourite standard folk songs. On Saturday morning the Trade Blankets were laid out early and some high quality plunder was bought, traded or just plain drooled over and wish listed. Following morning tea Ian and Peter did their stuff, setting up devious targets for the days shooting competitions, whilst Bob Ellis led unsuspecting hunters through our famous Mountain Man Hunt competition. To enter the latter, contestants must pay with a quality vegetable, placed in the cane basket with the turkey plate. Winner takes basket, plate and all! 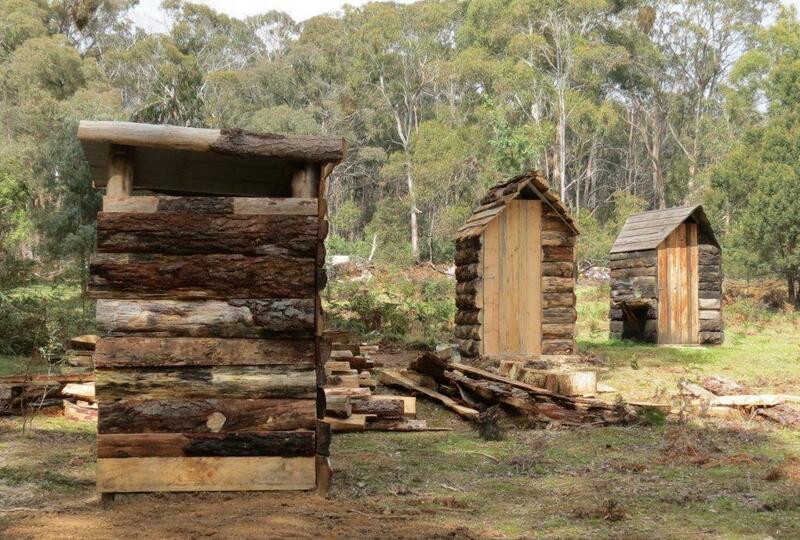 Somehow the idea that the Hunt winner should cook up a feast of vegies for the whole camp has slipped us by, again! It might have been Club president, Ian Convey, if a wooden spoon winner was needed to stir the pot. Anyhow, to restrict the event to a reasonable duration there were only five stations to be shot plus two beaver traps needing attention. Points were scored for sighting the game, an addition point for scoring shots, and or checking and resetting the traps. The ability to make fire without using the flintlock rifle was an added point, one which, this year, all participants scored. Each entrant was timed in case of equal top scorers. Just as well, as it turned out! Hunt times ranged from the quickest at just 4mins 42sec to the slowest at 11mins 50sec. The slow one being Paul (Le Reynard) Sly our regular contributor of real-life hunting stories; while the mean average was a little over 8 mins. The two high scorers, equal on 9 points, were runner-up Mark Pountney at 9mins 14sec and the winner, Charlie Timma, at only 6 mins 43sec. Congratulations to Charlie on a fine win. Other shooting challenges conducted on Saturday arvo were a balloon shoot at 20 yards, with elimination shoot off at 30 yards and final at 40 yards, won by Murray; a Rabbit’s eye shoot at 25 yards also won by Murray; Balloons with suspended clays at 55 yards won in just two shots by Peter Hawkey. Then our newest longer range challenge “Buffalo Head” shoot. This new target made up by Peter Convey was set up at ranges varying from 85 yards to 100 yards, and proved no trouble to our winner Jenny Baker, outscoring all the men using her sweet little .32 cal Squirrel rifle. As winner, Jenny was given the privilege to draw from the hat of Buffalo head contestants the lucky winner of the double curl original powder horn kindly donated by George Mohr. And the winner – none other than the target maker, Peter Convey! The day’s competition was wound up with lots of fun at the Knife & Hawk block with a large gathering of contestants. Yours truly flunked out straight after two failed practise throws. Most folks did much, much better. Charlie Timma won the Hawk using his full size axe, while Lyne Gray won the Ladies Knife throw and Bob Ellis the Men’s Knife. After a camp-oven roasted feed, and as the cooking fires died down when everyone gathered about the open-faced shelter, Ian announced it was time for a few awards. Prizes were handed out to those winners already mentioned above, generally these were either a hand-thrown period style crock, filled with local “Rusty Gun”, or a block of Cadbury “Moose Droppings”, both meant to be shared with all the runners-up, from first to last, so everyone becomes a winner at Rondyvoo! Ian had just one more award to present. Every couple of years Ian has made a special “President’s Award” to one deserving member. This has been a one year’s subscription to Muzzleloader magazine made possible by courtesy of Bill Scurlock and the wonderful folks at Muzzleloader Publishing. This time Ian’s award was presented to Bob Ellis, in appreciation of the tremendous work done to improve our rendezvous facilities (toilets and shower block), for the comfort of all attending events at Bernard’s Cache. Bob received a well deserved round of applause on presentation. Mick Humphrey tackles the Buffalo Head on bended knee. Gary Baker photo. Next, the final raffle tickets were quickly snapped up. One hundred tickets at one dollar each netting a quick 100 bucks for the club coffers. Donated prizes consisted of a demijohn whisky jug (empty), a beaut little eight sided priming horn (it shines), a canvas water bucket, a solid cast iron bean pot and a pewter mug – (it truly shines); while winning ticket holders chose in turn until the blanket was bare – a signal to start quaffing some of that rusty gun (liqueur musket) to lubricate the vocal chords ready for the sing-a-long that continued late into the evening. On Sunday morn we swiftly attended the business of our AGM, winding it up in just on a half hour. Next, Cam Cowled had fetched a trio of long bows, arrows and some natty targets for a primitive bow shoot, while a few others moved back to the shooting area for some black powder plinking. Generally everyone was having laid-back Sunday morning fun. Peter Hawkey followed his bee direct to the hive by winning the archery shoot and the large bucket of golden honey kindly donated by Cam. But some folks have to work. Don’t ya just hate it when the first camps start to break as pilgrims ready to go back home for another working week? I do! I even gets all melancholy just trying to tell the story for Around the Traps. But, there’s not much left to tell. There were only those muddied farm tracks left to negotiate, now we wouldn’t let that spoil a good weekend, would we, eh Matt? Rocky Mountain Rendezvous by F.R. Gowans gives a brief history of the fur trade rendezvous from 1825 to 1840. I would like to present an abridged version of each chapter which looks at each rendezvous in this period. William Ashley left Fort Atkins on November 3, 1824. Their route was up the Platte river to its south fork, up the south fork to Cache la Poudre, west to Pacific creek, and down the Big Sandy, to their destination at the Green river. They arrived there on April 19, 1825. While descending the Green river, Ashley cached his supplies at three different locations. What follows is a list of the different supplies carried but what is of interest is what and how much was carried, for example 150 lbs. of tobacco, 200 lbs. of coffee, 130 lbs. of sugar, 150 lbs. of gun powder, 120 lbs. of lead not to mention such things as ribbons tools and beads. Minnie Maud creek also known as Nine mile creek was the farthest point south to which Ashley travelled. Here he left the river and travelled north to the Duchesne to the Strawberry river and on to Red creek, where he met Etienne Provost who was trapping out of Taos. Shortly after Provost left Ashley, where he travelled to the Great Salt Lake, to trade with the Euteaw Indians before rejoining Ashley a few days later. Both Ashley and Provost arrived at the rendezvous site on June 29th or the 30th. On arriving at the rendezvous, we found the main body of the Salt Lake party already there with the whole of their effects. The general would open none of his goods, except tobacco, until all had arrived, as he wished to make an equal distribution, for goods were then very scarce in the mountains and hard to obtain. We constituted quite a little town, numbering at least eight hundred souls, of whom one half were women (we must assume Indian) and children. There were some among us who had not seen any groceries such as coffee or sugar for several months. The whisky went off as freely as water, even at the exorbitant price he sold it for. All kinds of sports were indulged in with a heartiness that would astonish more civilized society. According to his journal, Ashley left the rendezvous site with 50 men on July 2, 1825, and started for St. Louis. Therefore, the formal rendezvous lasted only one day. However, the mountainmen who gathered at the specified site had waited for several days for Ashley to arrive. Ashley’s journal contains some interesting facts about the 1825 Rendezvous, for example prices for the trading goods were as follows; Coffee $1.50 per pound, Sugar $1.50 per pound, Tobacco $3.00 per pound, Blue cloth $5.00 per yard, Scarlett cloth $6.00 per yard. There seemed to be standard prices for each item but often the prices would vary in dealings with different people. For example, sugar varied from $1.00 per pound to $2.00, tobacco sold for $3.00 per pound but sold to some for $2.00. Ashley usually paid $3.00 per pound for beaver (it is interesting to note that beaver was sold by weight not by the individual piece like other furs). Some mountain men received only $2.00 per pound of beaver these were the men who worked for Ashley and may have been the agreed rate at the time of employment. A free trapper on the other hand received $5.00 per pound. On July 2, 1825, the trappers loaded the fur packs on the horses and started for the Bighorn River by way of South pass. Ashley took 20 men to dig up a cache of 45 packs left probably by Jedediah Smith in 1824. They arrived on the Bighorn on August 7, 1825. There they constructed boats and loaded their furs for the descent of the Bighorn and Yellowstone rivers. Ashley and his company arrived at St. Louis on October 4, 1825. It was on this trip down the Missouri that Ashley took into partnership Jedediah Smith to replace Andrew Henry who was quitting the life. Thus the Ashley-Henry Company was dissolved and the Ashley-Smith Company organized. The value of the furs which Ashley brought into St. Louis varies according to which report is used. Different newspapers estimate the number of packs from 80 to 100 and the value from $40,000 to $50,000. In a letter to the American Fur Company, O.N. Bustwick stated the total weight at 9,700 pounds, packed in 100 packs with a value of $48,000. Atkinson’s journal also mentions 100 packs. From a random sampling of 21 packs the average number of skins in each pack was 32 and the average weight of each pack was 52 pounds. Therefore the average weight of each skin was 1.64 pounds, worth $4.92 at $3.00 per pound. Because of the hard winter, the mountainmen removed to Salt Lake Valley sometime during the winter and situated themselves in two camps at the mouth of the Weber and Bear rivers. James Beckwourth estimated the encampment at 600-700 men including Indians. Peter Skene Ogden was told by some Snake Indians on March 24, 1826, that they had spent the winter with Americans. The Indians numbered about 20 lodges. According to the website of Nelson’s Navy UK http://www.nelsonsnavy.co.uk, in the late 18th and early 19th century the Impress Service covered every port in Great Britain. Each major port had a captain in charge, known as the Regulating Officer, and the chosen base headquarters was called the Rendezvous. (I didn’t know that!) Having set up the Rendezvous, the Regulating Officer would hire some of the local hard men as gangers to form the Press Gang to forcibly recruit hands for service in British warships. 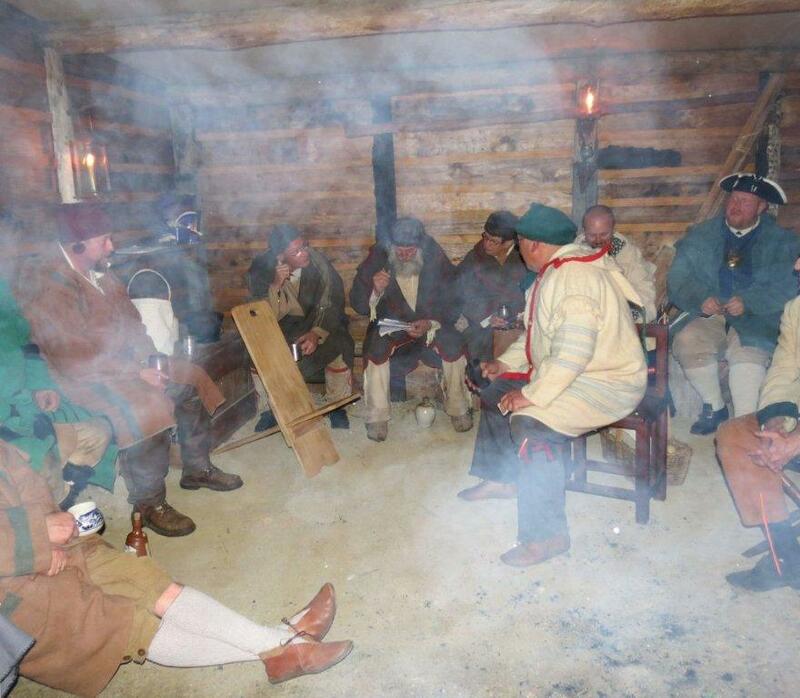 We have recently become aware of a number of Old Salts showing interest in trapper doings, to which we feel impelled to give the alert, lest Free Trappers be invited to a rendezvous they didn’t want, and find themselves pressed into King George’s service. Cancelled working-bee tasks were given priority listing. Murray hides from the Press Gang. Feb 15th/16th/17th Seymour Alternate Farming Expo – Our annual joint static display in conjunction with Bojo Tents – We exhibit our fun-loving hobby interests to the general community. It’s excellent publicity for all fun loving firearms enthusiasts! March 3rd/4th Time Line Fair, first time at new venue – Kryal Castle, Ballarat. March 9, 10 & 11th 1830’s meets 1930’s. Labour Day holiday weekend camp. We’ve invited members of the Austin 7 car club to witness our primitive black powder experience, joining us at a campfire luncheon on Sunday 10th March. A truly primitive camp at Bernard’s Cache during which, for just a few hours, we take a giant 100 year leap forward, visited by the Austin 7 club dressed in their best 1930’s style. No modern camping, no modern mules (4WD’s), only Austin 7’s on the Painted Pony Plains. 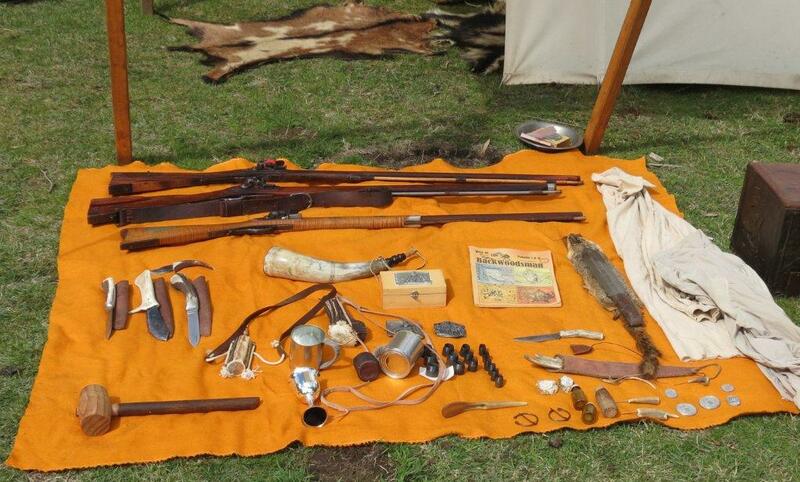 Camps to be open to visitors’ inspections; Trade blankets on display; rifles, knives and hawks on display; cannon capers; etc. rolling pin throwing comp and more. Campfires and powder burning will naturally depend on fire restrictions and weather. March 29th to Apr 1st Easter – from Friday to Monday at Bernard’s Cache, Caveat. April 27th / 28th ANZAC weekend (Note the 25th, ANZAC day is the Thursday). 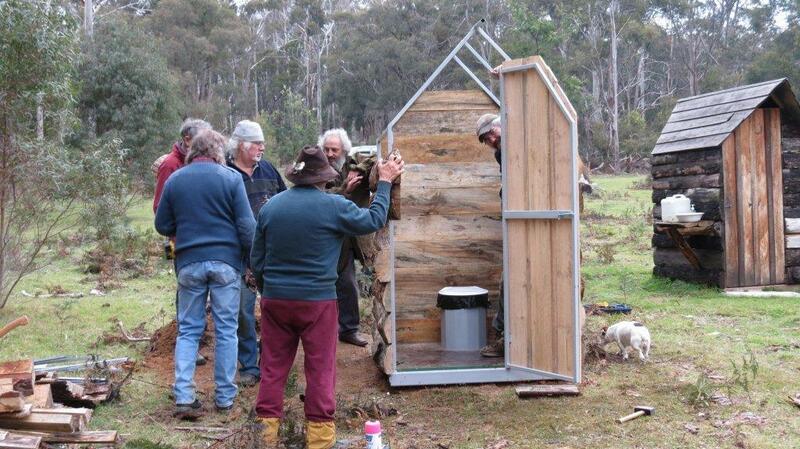 June 8th, 9th, & Mon 10th Queen’s B’day – Winter Quarters – Bernard’s Cache. 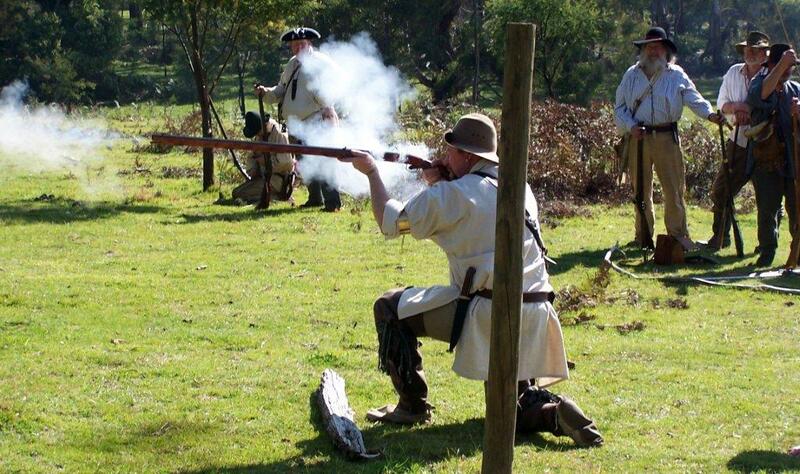 August – Attend Beechworth’s Ned Kelly Festival. Tent display and dress 1880 style. 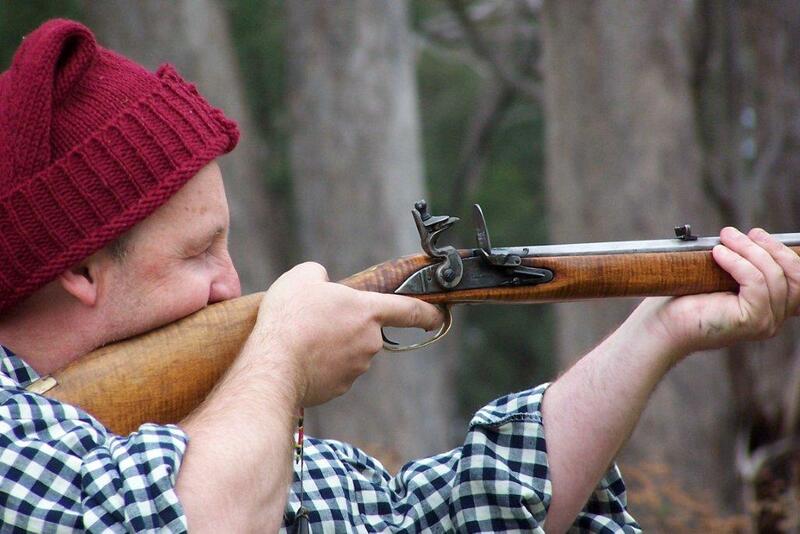 Rob Powell takes aim with Tippa’s old flinter – foofaraw and all. Gary Baker photo. Plews for shoes – Trivia. Having a senior day, I was in the local shoe store for some new winter slippers. I like the fluffy lambs-wool moccasin type for winter nights. Found a pair the right size and asked the price – $40.00. “Forty dollars!” I exclaimed. “It’ll be a cold day in hell before I’ll sell my shoes for forty dollars” I heard my incoherent muttering. Funny thing, I had a difficult time explaining my raving to the store keeper, shoes rhyming with plews, and all. The sales lady was still shaking her head as I left with my purchase. But, hasn’t everyone watched Charlton Heston in The Mountain Men? At least twice, well, maybe three or four times? Say, it’s a good night for a DVD! Mark Pountney says he likes this gun. Jenny Baker photo. A few thoughts fired at Random. Consider whether you are using more powder than necessary for just plain plinking. Use greased patches for hunting, spit dampened patches are fine for range plinking. Seat ball firmly on powder, do not pound or bounce ramrod on ball. Use the same steady pressure to seat ball on each loading. Who the heck is Random anyway? You must be able to see the rear sight clearly, i.e. without any fuzzy double edges. When hunting, don’t take offhand shots if there is an alternative of using a tree trunk, log or stump etc. to help steady your aim. Squeeze the trigger – don’t jerk it! Has anyone actually met Random? After the shot, always pause, holding you sights on the exact aim point, until the ball strikes the target. A “Factoid” from George – “Your tongue is the only muscle in your body that is attached at only one end.” Now I’ve heard talk about loose attachments!!! September morning! Photo by Ian Convey. View More Pictures? Check our updated gallery at http://freetrappers.org.au/gallery/.